Little House Home Arts: Generosity or Curse? One Can't be too Careful! Generosity or Curse? One Can't be too Careful! My daughter's return didn't just change the atmosphere in the house, it literally changed how we navigated. Only two steps in the door, she plopped down all that had been packed in her car. The mudroom/ pantry/laundry room not only collected her bags, complete with dirty laundry and souvenirs, but also a plethora of fresh produce. 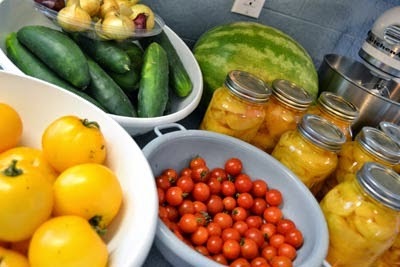 It seemed that she had taken to stopping at every roadside stand to collect fresh fruits and vegetables on her way home! Not only would we have to watch our step but we would be thrown right into canning. Fortunately she anticipated my reaction and quickly added that that she had a plan: she would place her smaller collections in the refrigerator, blanch the wax and green beans herself to prepare them for freezing, then she would season and roast the tomatoes and freeze those for sauces, and only then did I generously offer to help with canning thirty pounds of fresh peaches! The fifteen pounds of beets were carried to the basement where it is cooler in hopes that they will wait till the end of the week to pickle. This month's housecleaning was instantly undone, and our house status is now "back to normal"...chaos reigns again! Fortunately she brought me home a new Ann Rule book to take with me to my upper tower room, where I can hide out and read about what is even more frightening than my daughter's return to rule! These stories of true crime will make me appreciate my daughter's good and generous heart, though it should be noted that I carefully watch her or my husband take the first bites of her home-cooked cuisine....one can't be too careful these days! My favorite aunt used to say, "Just because I am paranoid, doesn't mean someone isn't out to get me". I quite agree and I am sure that Ann Rule would too! No Idle Hands or Brains at Little House!! Address Books Should be Kept in Pencil!